LCC graduate Margot Lombaert is the creative force behind the identity for Adopting Britain, a major exhibition (open now until 6 September 2015) at Southbank Centre which highlights the personal stories of migrants and refugees. Margot, a PGDip Design for Visual Communication alumna, worked with interior design studio Plaid on the project. As the studio’s only graphic designer, she designed the identity of the exhibition, developed the concept and produced the artwork. 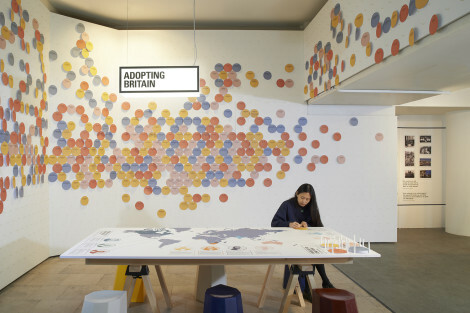 ‘Adopting Britain’, Southbank Centre, 2015. Photography by Leon Chew. Plaid explain that the show places visitor participation at its heart, taking a lo-fi and tactile design approach. 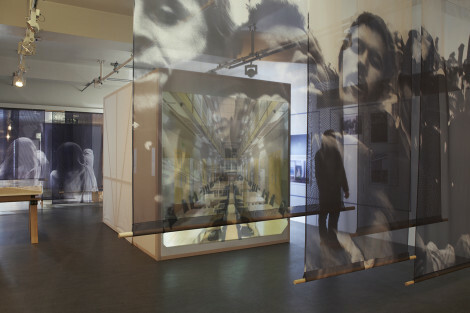 Visitors are encouraged to feel involved with the exhibition using participation points, immersive audio-visual displays, large contextual graphics and bespoke exhibition furniture. We asked Margot to tell us more about her experience of working on the brief. What did you hope to achieve with the identity of Adopting Britain? This exhibition addresses a very broad yet important topic so we wanted the identity to feel accessible to all visitors. The austerity of the bold typography inspired by the official immigration form is balanced by a very colourful environment. We used lines of colours to define sections within the exhibition and also to reflect the paths and routes of a migrant’s journey. This graphic approach will also communicate to every Londoner used to the visual communication of public transport and road signs. The schedule of this exhibition was particularly challenging. We only had a frame of one month from the concept to the artworking of the exhibition. That tight programme forced us to take quick decisions without compromising our design approach and attention to detail. It definitely was a very busy month! Visitor participation is key to this exhibition experience. We wanted to engage with the public and encourage reflection and debate amongst visitors. 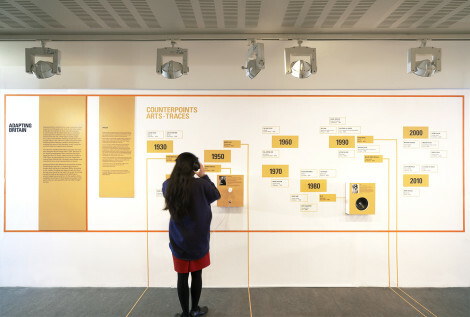 For instance, the exhibition begins by asking visitors to share their migrant stories. Did they move to the UK? Do they have any known relatives who moved to the UK? Visitors can write their stories on a round card they hang on the entrance wall. Very soon after the opening, the wall was already covered by beautiful stories and positive messages about migration. I am myself a migrant and I believe that migration brings richness, not only to the economy but also by creating interaction between different cultures. Too often we hear in the media hostility towards immigration but by actually looking at the stories covering this wall, all I can read are messages of hope and love. You’re now working on the British Library’s upcoming West Africa exhibition. What does the brief ask for and how are you responding to it? This exhibition takes a bold, challenging and celebratory look at West Africa. It will reference a millennium of history, from the great empires of the middle ages through colonialism, resistance and independence, to contemporary life and culture. This exhibition is an opportunity to increase the diversity of the British Library’s exhibition audience and to engage particularly with those of West African heritage. We are aiming to provide an immersive 3D experience through light, colour and a 3D environment inspired by the visual and sonic culture of West Africa. Weaving and textiles are central to West African history and this is our way of approaching the exhibition’s visual language. We are carefully studying the symbolism of West African patterns to create a meaningful graphic system that will echo the richness of their written language. The broad spectrum of symbols and our brightly coloured approach will engage with Africa’s incredible diversity.